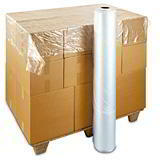 It’s no good wrapping your product in the most effective protective packaging available if you then just leave the boxes they’ve been packaged in lying around on a loaded pallet exposed to whatever conditions may be thrown at them. Here you’ll find pallet covers providing both short and long-term protection against the effects of dust, moisture and even the weather. 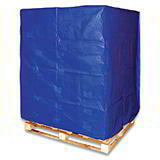 From tarpaulin-style reusable pallet covers which offer long-term all-weather protection to low cost disposable polythene pallet covers and plastic pallet top sheets to keep dust and rain off a wrapped pallet, we can help provide the most reliable and most cost effective solution for your business. 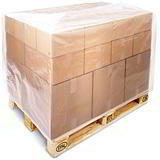 Once you’ve loaded your products on a pallet and wrapped them to ensure they’ll be stable, it’s easy to think that’s job done. However, unless you have total control over what happens to it next, or over the weather, how do you know that it won’t have to sit for even a few minutes in a heavy downpour, or that the racking it’s stored on will be free from dust and moisture? These pallet covers help keep your pallet – and the products loaded on it - in the best possible condition, by offering all-round reliable protection, and mostly available for immediate dispatch from our warehouse.